With minubo, you get tech and tools in one solution: From standard and custom integrations across a high-performance ETL process and a flexible analytics database that has a built-in commerce data model, to the tools you need for a data-driven work culture. No matter whether you choose the Application Suite or the Store Monitor: There's always a full BI tech stack included. 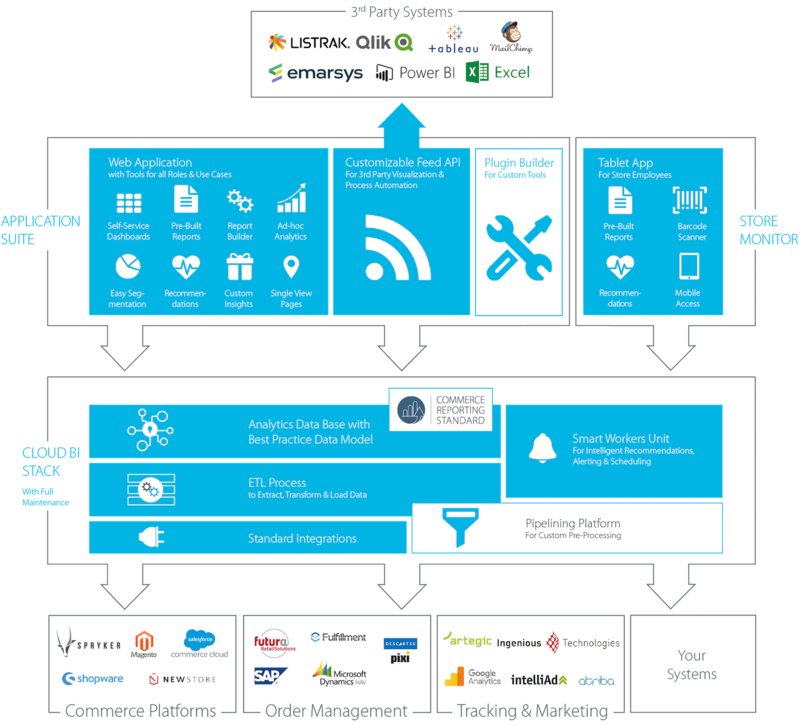 So here's some more detail on how our Commerce Intelligence Cloud is designed and which components are included. The idea is simple: You can have the full package or use our BI stack with one of the frontends only: the Application Suite or the Store Monitor. Learn more about the individual components of our solution. If there are any questions remaining, don't hesitate to contact us! The Application Suite is our comprehensive web-based tool set that enables your entire organization to establish better, data-driven decision-making and intelligent process automation. On top of a wide range of tools for all roles and use cases, the Suite comprises our customizable Feed API that enables 3rd party visualization and process automation, as well as a Plugin Builder that makes it easy to build your own tools based on the minubo Analytics Data Base. The Store Monitor is an easy-to-use tablet app that brings data-driven decision-making to your stores. With every employee having easy access to relevant business data, retailing is taken to the next level: Better decisions on which products to promote or to reorder, full transparency into brand, category and product performance as well as immediate insight into stock levels by scanning a product's barcode – all added up to increased business efficiency and customer retention. Based on elasticsearch, a super-fast search engine technology, we have developed a best-in-class analytics data base that ensures extraordinary performance on all levels of data querying – from the highest aggregation down to the raw data level. This does not only enables us to offer a wide variety of data tools, but also, it enables you to use minubo's data flexibly in 3rd party systems. Not only is it super-fast and flexible, our Analytics Data Base comes with a built-in commerce data model – based on the best practices we gathered working with countless commerce companies and adhering to the Commerce Reporting Standard. Even more than the tech setup, the built-in business logic is what saves you the most amount of time when using minubo instead of building a BI stack yourself. Extract – Transform – Load: This is what has to happen with your data on its way from the source system integrations to the Analytics Data Base. Our ETL process is built on Apache Spark, a unified analytics engine for big data processing that ensures great performance, high efficiency and – most of all – full scalability. No matter how fast you grow: Our processing grows with you. A comprehensive analytics solution requires complex calculative logics and some built-in intelligence. For minubo, this is part of our Smart Workers Unit: An architectural component that, for example, provides the alerts and action recommendations for our Heartbeat, which is our proactive insights stream, and allows scheduled email dispatch of dashboards and reports. To be able to offer a state-of-the-art tech solution with high efficiency in terms of performance, operations and cost, minubo is hosted in a fully scalable cloud environment at Amazon Web Services. So not only do you pay just a fraction of what you'd pay for your own hosting environment, but also, you don't have to allocate any resources to maintenance. We do all the work for you. Besides our standard integrations (below), minubo has a Pipelining Platform that allows us to integrate data from any source system. Custom pipelines transform your data into the format of our Generic API, so it can be integrated into our processing and data model. The platform does also enable our customers to gain transparency on the multiple steps of pre-processing or even build pipelines themselves. Besides our custom data pipelining, we are developing more and more standard integrations as we go, so we're able to connect more and more systems with a simple plug & play approach. And it's not only about source systems: We do also offer outbound (or bi-directional) integrations to 3rd party systems – particularly operational systems, such as email marketing technology or visualization tools like e.g. Tableau.